One on one interviews are the mainstay of corporate America. Here are a few things you can use to your advantage in a one on one interview. Horns or Halo: There is something called the horns or halo effect. You want to make the best impression as soon as possible in the interview. If they like you right off the bat the interview will likely be better for you. A seasoned interviewer may know how to mitigate this effect but the fact is that an interviewer is much more likely to hire someone they like. Follow up: You only have to write one follow-up/thank you email so you can spend more time crafting it. ALWAYS follow-up! As I write this there are candidates whose interview outcome hinges on whether or not they follow-up with their interviewers. A well crafted email definitely helps. Body language: Mirror (but not exactly) their body language. If they are sitting up straight and more formal you want to do the same. If they are more casual, then you might want to cross your legs. It is also a good suggestion to match the cadence of their speech. Don’t talk fast to a slow talker. Ask for feedback: An interviewer is much more likely to give you some direct feedback when it is just you two in the room. Many interviewers are worried about being judged by others just like you are as a candidate. But if it is just you two, then they may be more forthcoming with information. If you are prepared, interviews can actually be fun. Where else in life are you encouraged to talk about yourself? One of the most dreaded interviews are the ones that happen over a meal. I like these interviews because I want to see how people REALLY act and meals give lots of opportunities for problems. As I say “Any idiot can handle it when things go right, you see what people are made of when things go wrong.” Things always go wrong, sooner or later. Where to go: If they give you the choice, give them two options to choose from. No matter where you go I would go by before the interview to scope the place out. Just like in other face to face interviews you want to know how to get there, where to park and how long it will take to get there with traffic. If you have any dietary issues, definitely plan ahead. Let’s say you have Celiac Disease, Crohn’s or some other intestinal related medical problem. Look at the menu ahead of time and if you need to ask detailed questions, do it before your interview. What to eat: There are two schools of thought on this. One, eat something easy. It is a smart and safe move. Two, go bold and stand out… spaghetti with meatballs. Whichever route you take, don’t plan on eating a lot, you are there to talk so don’t go when you are very hungry. Etiquette: If you are not familiar with etiquette be sure to brush up. Let’s say you go to lunch and you are at a tight round table with six people. Which water glass is yours? Do you eat European style or American? Figure this stuff out before you need it. Tricky Situations: During an etiquette dinner I was hosting, a student asked “what do I do with my sugar packets from my coffee?” My answer, “drink it black and you don’t have to worry about it.” Remember, this is not about you getting what you want to eat and drink, it is about the interview. 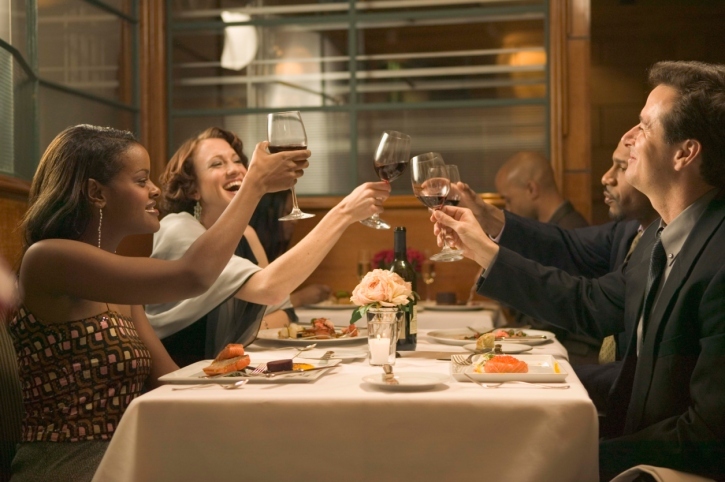 Drinks: It is best to stay away from alcohol but if it is dinner and the host orders a bottle of wine they might take offense if you do not have some. If you do, just have ONE glass and make it last. I like to order an Arnold Palmer. I like the taste of it and it is a little unique, which can make a lasting impression. Small bites: The rule of thumb is to only take a bite that you can get down in three chews. That way when they ask you a question right after you take a bite you don’t have to stare at them while you look like a cow chewing on your cud. Remember, this is more about the interview than the meal. Lastly, the general rule is no to-go boxes, sorry. One of the up and coming types of interviews is the Skype, online or video interview. These interviews are great and terrible, all at the same time. These interviews offer a chance to “meet” each other face to face and avoid the necessity of travel or taking time off to interview. 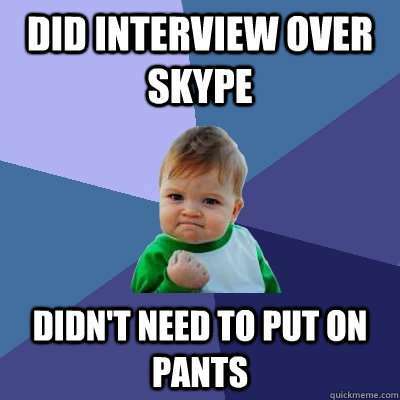 They also allow for panel interviews with people from various locations. Many of the same issues in face to face interviews come into play, but they are made more difficult. That shirt you love to wear with that unique pattern gives people a headache over video. Think of the worst YouTube video or podcast imaginable and then imagine it determining your fate as a candidate. Here are some things to keep in mind and pay attention to. Bandwidth: Speed test your upload and download speeds. Generally speaking you want at least 6mb down and 1mb up. Be sure to test your connection with a friend before a real interview. You may need to use your mobile device or tablet if you have a strong LTE signal or go to a friend’s if they have faster internet speeds. Whatever option you go with, test it! Be sure to close other programs on your computer as they can also slow things down. Backup Plan: What is your backup plan if things go wrong? Let’s say you tested everything yesterday but today, when you logon five minutes before your interview, the computer’s virus software decides to run a full system scan. What is your plan when the power goes out? Stay Calm: No matter what happens do not start to lose your cool. One of the reasons that I like doing online interviews is that it requires candidates to follow directions, plan ahead and stay calm when things go wrong. Something almost always goes wrong. Location, location, location: DO NOT interview in a public place and do your best not to do it in your car. Maybe this is a personal issue but I am tired of seeing head shots of people in their car. What is in the background? It it distracting? Is it appropriate? What other sounds can you hear? Will you be interrupted? How do you look? Most of us look like we are the walking dead when lit up by a monitor, so check it ahead of time. You may want to change the lighting in the room. You also want to be sure you are not back-lit and all they get is your silhouette. Wardrobe: Dress as if this was a face to face interview. Check your look on camera. Some outfits do not work well for video interviews. Notes: Just like in a face to face interview, have your resume and questions with you. The upside is that you can write notes to yourself that they cannot see, like ones reminding you to smile, look at the camera and to ask what the next step is. Body Language: Eye contact is with the camera, not their image on the screen. Do not look at other things in the room or leave the viewing area. Also, watch how you use your hands, they can be distracting. Lastly, don’t forget to smile. Video: Pay attention to how you are framed in the shot. You might want to place the camera a little farther away so your image is not distorted. No sudden moves. If the bandwith is low the movement will look choppy. Audio: Practice ahead of time and see if a friend with switch places with you. That way you can hear the audio quality for yourself. Again, one of the biggest things to keep in mind is DON’T PANIC if things don’t go as planned. There are a lot of resources on the web about why interviews go bad. Here are a few things to keep in mind before, during and after the interview. Before the interview: A lot of people fail before the interview ever starts. Follow instructions: If they tell you to bring 3 copies of your resume, bring three. If they tell you to dress professionally, do it. I have some friends that were Army Rangers. When you are sent to Ranger school they tell you EXACTLY what to and what NOT to bring. Guess what? If you bring Gortex socks.. you’re out! No really, they send you packing. Plan who, what, when, where: Who are you meeting with? Look them up on LinkedIn. What do you need to bring and wear? Don’t wait till the day of or before you print off your resume, shine your shoes (yes, it does matter), press your clothes, etc… When do you need to be there? Reconfirm the date and time with the company. If it is a phone interview watch out for time zones. Where are you going? Plan for traffic, parking, and other issues. 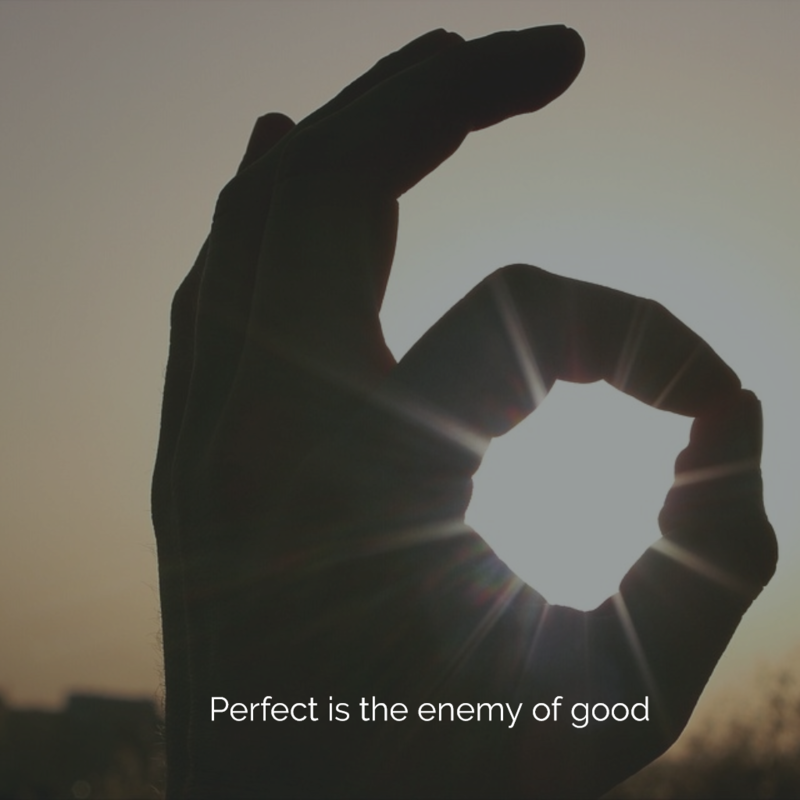 Remember your P’s: prior planning prevents poor performance. Research: We already mentioned researching the people. It is VERY impressive if you introduce yourself before they do. How can you do that? Look them up on LinkedIn, most people have a head shot. Also research the industry, competitors, company, and position. Glassdoor is a great resource for this. I have said this a lot but it continues to be true, just ready a company’s website seems to be rare these days. Write down your questions: It does not matter whether you write them in your phone, tablet or put pen to paper but write down your questions and bring them with you. That way you don’t have to worry about remembering them. It also gives you the ability to take some notes. During the interview: The interview starts the moment you walk out your door. Driving: Take your time since you left early. Don’t get stressed out and be gracious to other drivers. That person you just told were number one? That might be the hiring manager. It has happened! I usually arrive 20 – 30 minutes early and scout out the place. Then wait somewhere close by and come back 15 minutes before your interview time. No rush. Arriving: Assume that someone (everyone) is watching you as you get out of your car. The visitor spots are often times in top-management’s view. Get your smile on. Remember, we usually ask everyone what they thought about you, including the receptionist. Body language: This is sometimes a cultural issue but you want to make good eye contact but don’t stare. Have a good firm but not painful handshake. Sit on not in the chair and lean forward a little. Don’t cross your arms or play with your hair. Watch out for nervous habits that can be distracting. Good posture. Dress for Success: This use to always mean wearing a suit but these days it can have different meanings. The basics are to be sure your clothes are clean and fit well. You do not want to be uncomfortable in the interview. You want to match the culture of the company and dress just a little better than the management. Q & A: There are too many issues and options to discuss here. 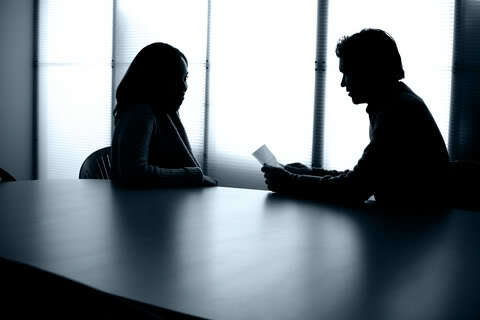 I will blog about interview questions soon. Questions to ask: Here is a blog post I did on questions to ask in an interview. They are very important for you and the company. After the interview: Do your best to get everyone’s contact information during the interview. Thank you: Be sure to write each person a thank you email. Thank them for their time, tell them again why you want the position, why you are a good match for them, and you look forward to the next step in the process. You did ask that, right? Follow up: If you have not heard from them in the time frame they gave you I would follow up. When you have not heard from them always assume the best. Maybe their email went in your spam filter. Maybe your roommate forgot to give you the message. Maybe they dialed the wrong number. Aside from being a bad match for the position or the position a bad match for you most people mess up in the one of the areas above. Remember, just because you did not get a job it does not mean that “messed” up. Sometimes there was a better match in the process or maybe they saw something that leads them to believe you would not be happy or successful in the position.